Need for Speed: Underground (NFSU) is a racing game, developed and published by Electronic Arts in 2003. It is part of the Need for Speed computer and video game series. It was created at the EA Black Box studios, located in Vancouver, BC. Its premise (highly tuned, customised cars participating in illegal street races) was likely inspired by the Import Scene and the movies The Fast and the Furious and 2 Fast 2 Furious. A complete reimagining of the series' formula, NFSU offered a career mode featuring a storyline, and a garage mode that allowed players to fully customize their cars with a large variety of brand-name performance and visual upgrades. All races take place in a city at night. Instead of hundred-thousand dollar exotics, Underground featured vehicles associated with the Import Scene. This, plus the increasingly arcade-like controls, became points of controversy for Need for Speed fans. Despite this, Underground was commercially very successful, and inspired a sequel. It is rumoured that the car manufacturers were very strict in how their vehicles were to be portrayed in this game, especially considering the "illegal street racing" reputation of the tuner culture. EA took some effort in making the races appear as sanctioned racing events, and included a public service announcement in the game's introduction. In addition, vehicles do not have damage models. Underground sold over 15 million copies worldwide. The player starts straight into the action, at a circuit race driving a uniquely styled Acura Integra Type R with wide body kit, easily winning over his opponents...only to be woken up by Samantha from his daydreaming. Samantha is the player's friend in the new country; she shows the player how the console with the races works, who's who, and makes fun of the player's car. Eddie (and his orange-metallic Nissan Skyline R34), is the leader of the Eastsiders and current top racer of the streets, and Melissa is his girlfriend. Time passes, races are won. The player meets other racers, and eventually gathers a small list of nemeses that continually challenge him and are defeated. He's introduced to TJ, who promises unique vehicle upgrades in exchange of beating time trial challenges; Samantha does the same from time to time, offering unique visual modifications instead. The player's successive victories don't impress Eddie. First, he mocks the player's skill, saying he has a long way to go to 'roll his streets'. Later in the game, the player builds enough hype to be too hard to ignore, so Eddie challenges him to beat Samantha in a sprint race before coming after him; the player's willingness in going for it infuriates her. Samantha totals her Civic's engine trying to beat the player, unsuccessfully. TJ takes the junked car for himself after the event. When the player comes close to reaching #1 in all kinds of races, Eddie tries to once again get rid of his rival. Around the same time, the Player sees TJ in Samantha's recovered car, now working again, but has been vandalized. Both run a circuit race worth the other's vehicle, which the player wins. The player returns the car to Samantha to make amends, and she gives the player a choice of a wide body kit for his car. Right after the touching moment, Eddie challenges the player and loses, like everyone else who ever challenged the player so far. Before any victory can be sung, a mysterious, legendary silver Nissan 350Z challenges the player for a last run through the Market Street circuit. A challenger who, after being beaten by the player, is revealed to be Eddie's girlfriend, Melissa. 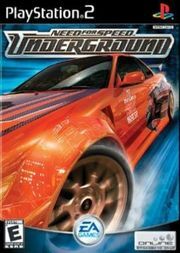 That event solidifies the player's status as the new best underground racer in the city.